he Clydesdale horse breed varies from different shades of bay, brown, chestnut and black, predominantly with one solid color, often with a white underbelly as well as a white feather. Clydesdales are familiar to draft horse. They are beautiful movers with a high stepping gait, which made them popular as flashy carriage horses. Today they are popular in the show ring and as fancy carriage horses. 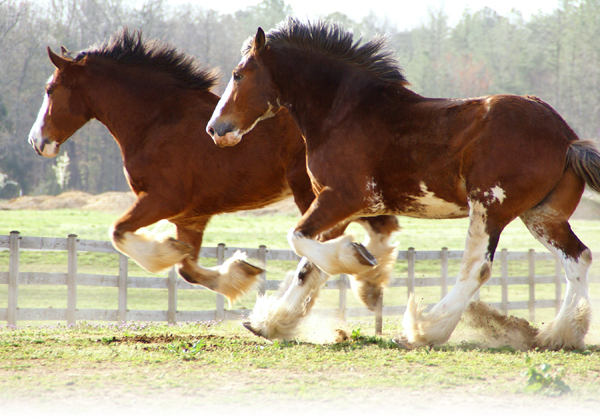 The most well-known Clydesdales are the Anheuser-Busch Clydesdales. The Clydesdale was bred to have large, well-proportioned feet and sound legs for walking on hard, cobblestone roads. They have longer legs and a more streamlined body than most draft breeds. The name 'Clydesdale' is from the Clyde Valley in Lanarkshire, Scotland (previously known as Clydesdale) where it is believed to have originated. It is the only living heavy horse from Scotland. These draft horses were traditionally used to pull carts and carriages until the development of the automobile in the 1930's. As the Clydesdales tend to be too large to fit in furrows, they were not well suited for use as plow horses. They have been used in the United Kingdom as ceremonial drum horses in many royal processions. The Drum Horses lead the Household Calvary, ridden by drummers who work the reins with their feet while holding drumsticks in their hands.